Two of nowadays best extreme metal bands from Europe are teaming up for a co-headline tour in spring of 2015. Comments Metal Blade recording artists DOWNFALL OF GAIA: "Time runs way too fast! When this tour will hit the road it's almost 9 months ago since we played a show in Europe. Even if some time off of the road was needed - that's way too long! So all of us are pretty happy to be back on the streets and to play some of our favourite European cities together with DER WEG EINER FREIHEIT, one of the most interesting bands out there!" 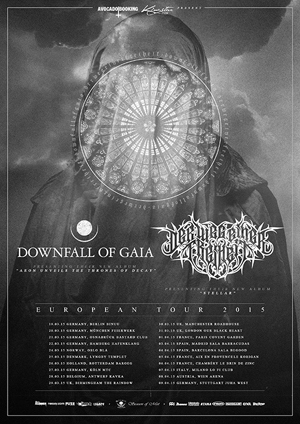 DOWNFALL OF GAIA have released their second album for Metal Blade Aeons Unveils The Thrones Of Decay in November. Aeon Unveils The Thrones Of Decay is a story about time and its relentless sides. A journey to the dark sides each individual has to fight on a day to day basis. Time in its majesty is an unbeatable enemy and all of us human beings have to deal with loss, unexpected changes and dealing with unwanted circumstances. As a slave to time, mankind is marching to the beat of a ticking clock. Musically the album gives you less time to breath and a more aggressive songwriting than on their previous releases, as aggressive and relentless as time itself! Surf over to the landing page at www.metalblade.com/downfallofgaia to order your copy of the album!